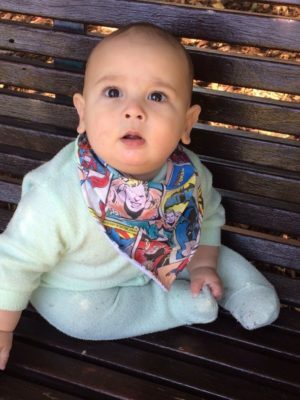 I’m planning two quilts for my boy. 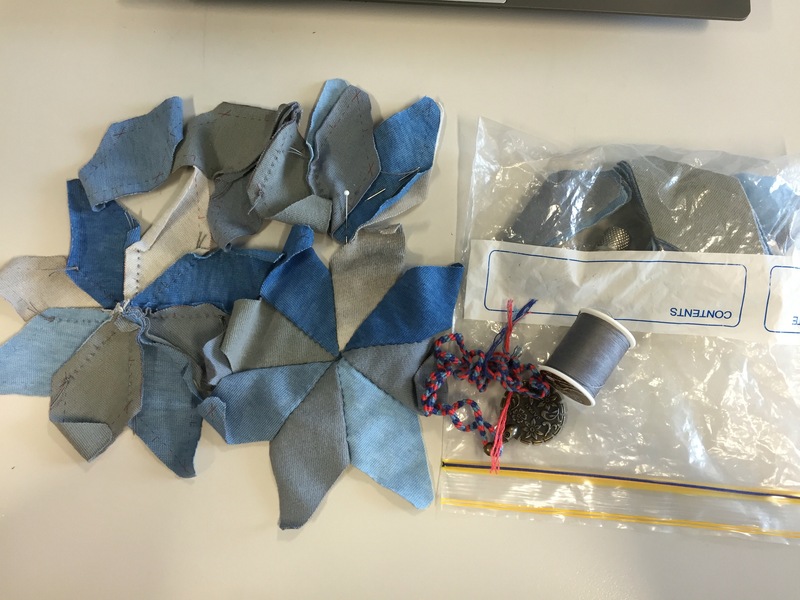 A clamshell and a compass star quilt. I’ve made a start on the clamshell because it will be a smaller “baby” quilt even though he is more kid than toddler these days. I started off with this print that I bought last year and added some homespun colours. 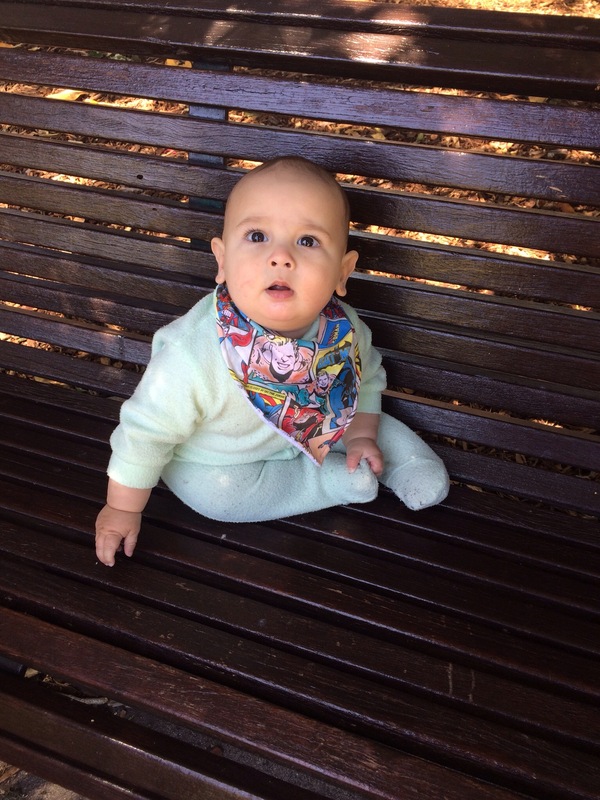 Then, with his obvious attraction to Spider-man, I added a couple of those fabrics plus a red to unify the look. 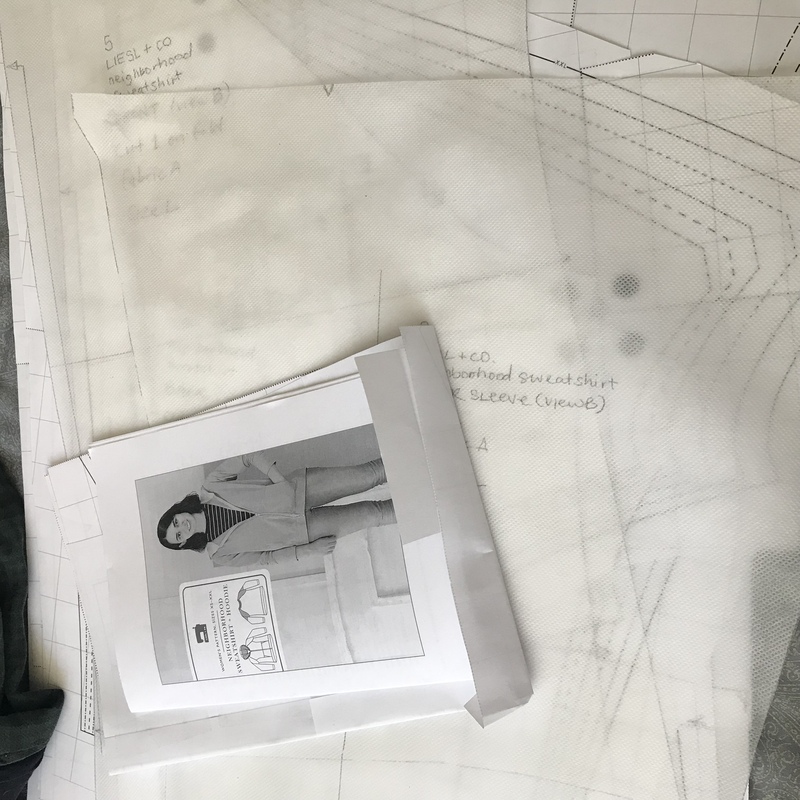 I didn’t take a photo of the fabric choices, but I did take one of my final layout after printing and cutting out all the shapes. Yeah. Because it’s not enough to make the blanket according to the original instructions. 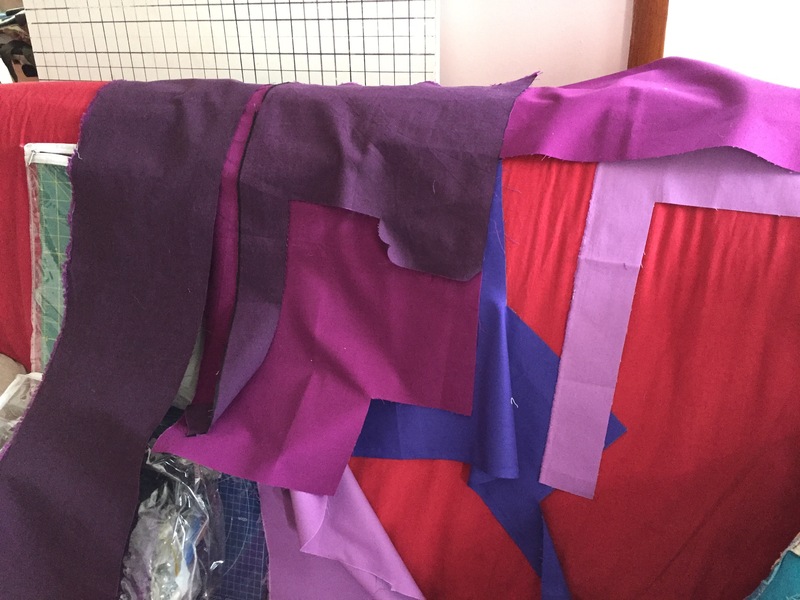 And actually, because I opted to use Inklingo to create the shapes, it’s already different and adding a few more of my own choices make the blanket truly my own. Right? 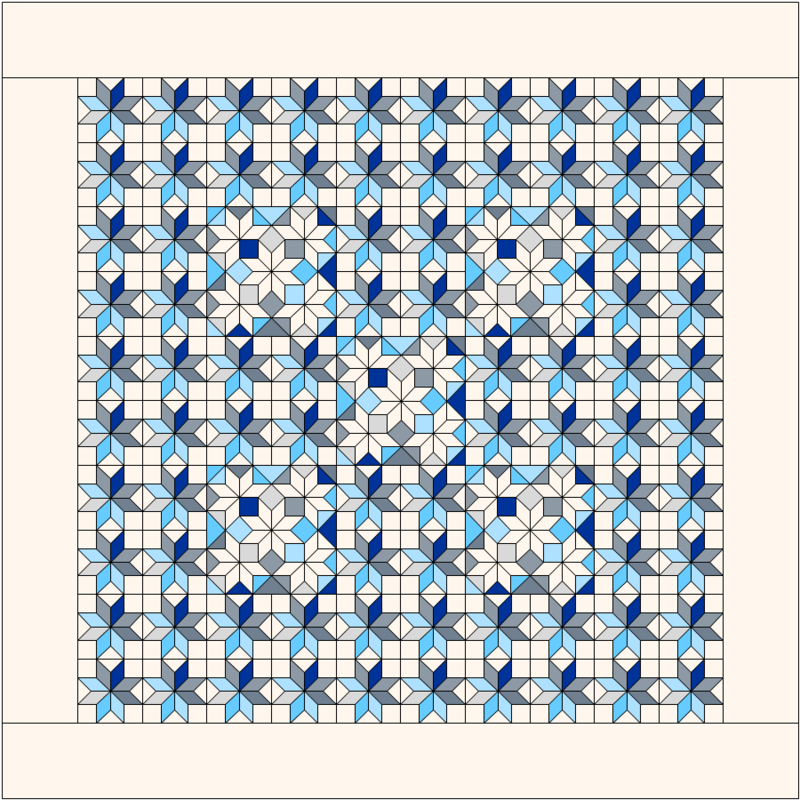 Right!So I recreated the original pattern in EQ7 so I could try a few tweaks. 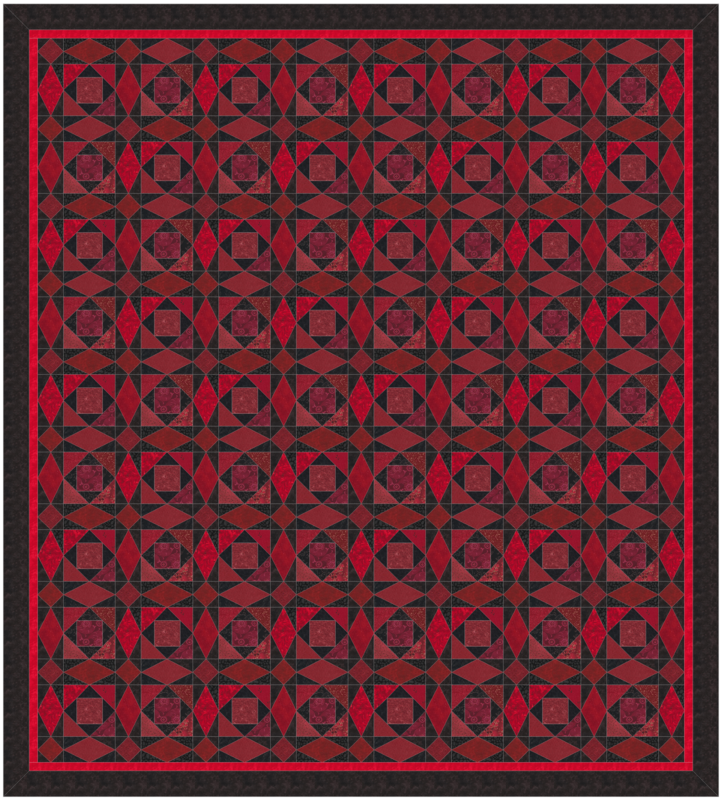 This uses the 6″ Le Moyne star collection and measures out to 62″ x 80″. Ideas I had in mind included a medallion, like the carpenters Star, Waltzing Matilda star, or the Inklingo star. But the medallion looked too small at 12″, So I tried a 12″ block in each corner in addition to one in the center. 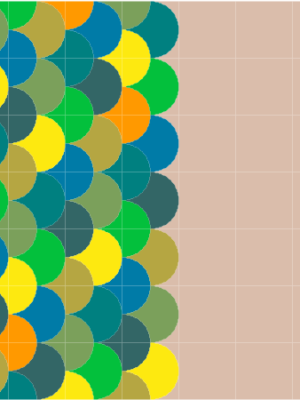 Then it occurred to me to try reversing the colours so that the blocks were more obvious. I still haven’t decided what I’m going to do! I should be making new clothes for myself (Liesl + Co is 25% off today!) 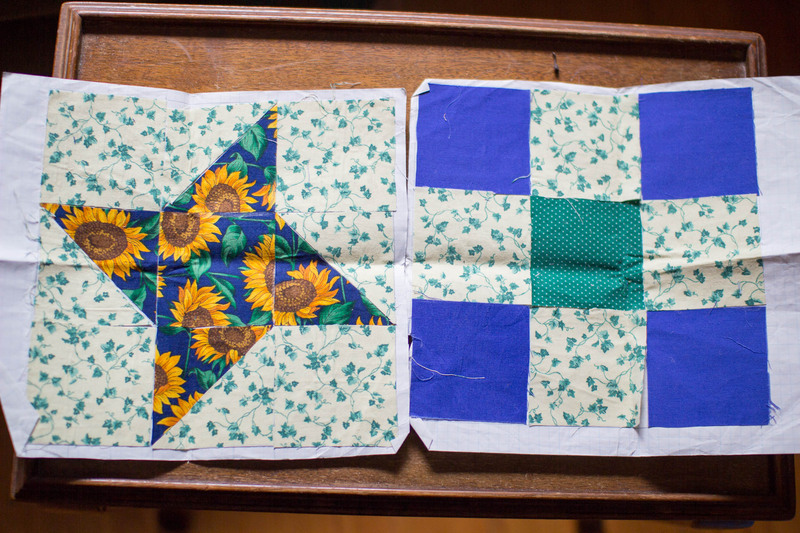 or for the kid, or sorting my scraps, or finishing a quilt that was started for someone not in my life anymore. Should. 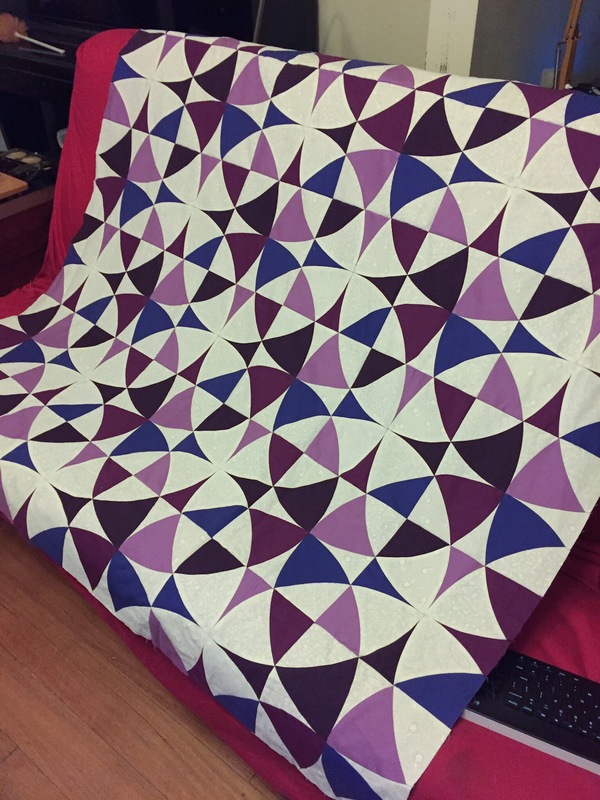 But my sister has been waiting for her promised quilt for a decade now. So I’m prepping to print Storm at Sea using red and black fabrics for a scrappy look. Mocked up in EQ7, this measures 83 x 92 inches, including a one inch and 3 inch border and using the 9″ Storm at Sea Inklingo collection. 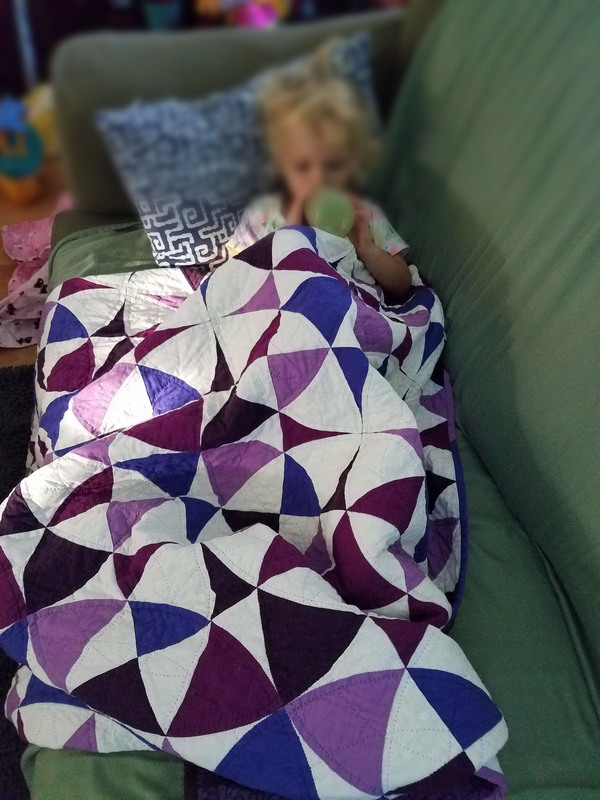 So I finally finished this quilt! Technically, I finished this on September 29th, but I’ve been slow to post because I had a minor disaster with my photos. I lost the majority of my photos from our recent trip to Hawai’i and the quilt photos were amongst the lost files. I’ve finally given up on recovering the RAW files and I’m making do with the previews I could recover with Jeff Friedl’s plug-in for Lightroom. So here we are, a month and a half later, celebrating a finish! I started planning this December 1st 2013 according to my post! Now, I did quilt another queen-sized quilt and made several other things in the meantime, including my little jerk! He takes up SO much time! So, nearly three years later, I’m closing the book on this quilt. It was full of easy curves and hidden circles. I love the precision afforded me with Inklingo. It soothes the perfectionist side of me. Next up is Storm at Sea for my sister. It’ll be scrappy-ish and I’m in the planning to print stage. 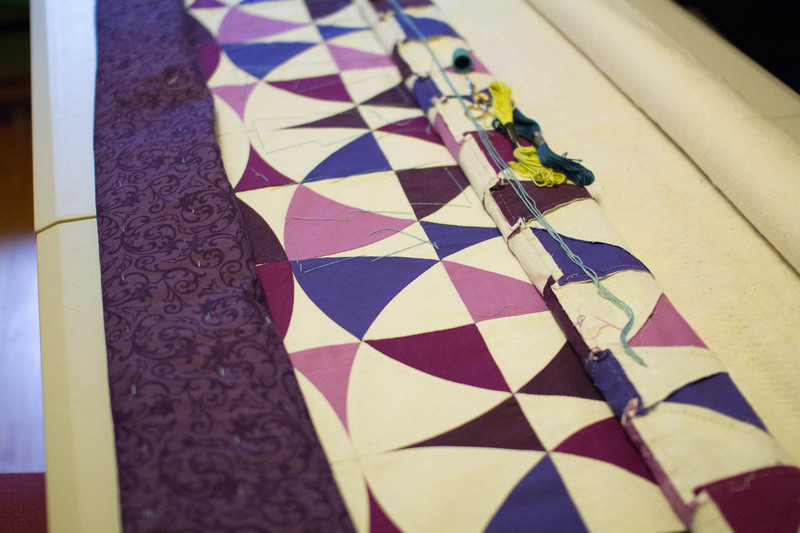 Not much to say other than this quilt will be done very, very soon! 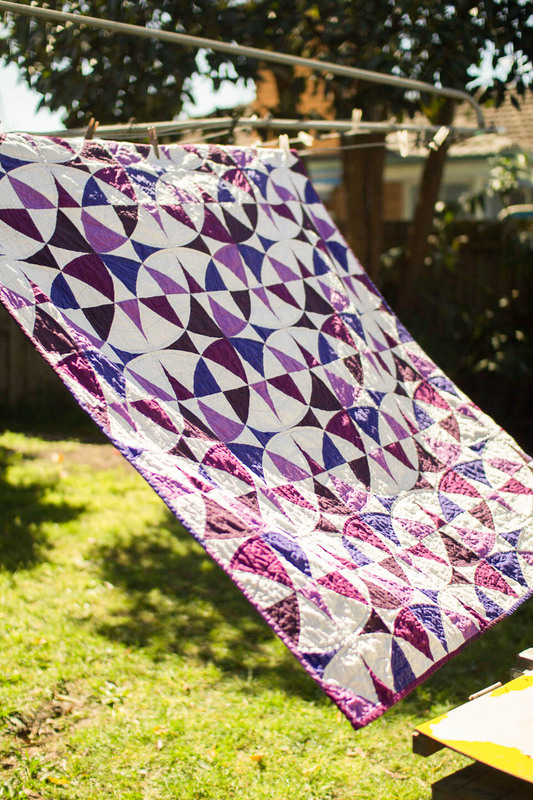 My October deadline is looming, but I put my head down and got the quilting done! And the binding made and machine-sewn on! 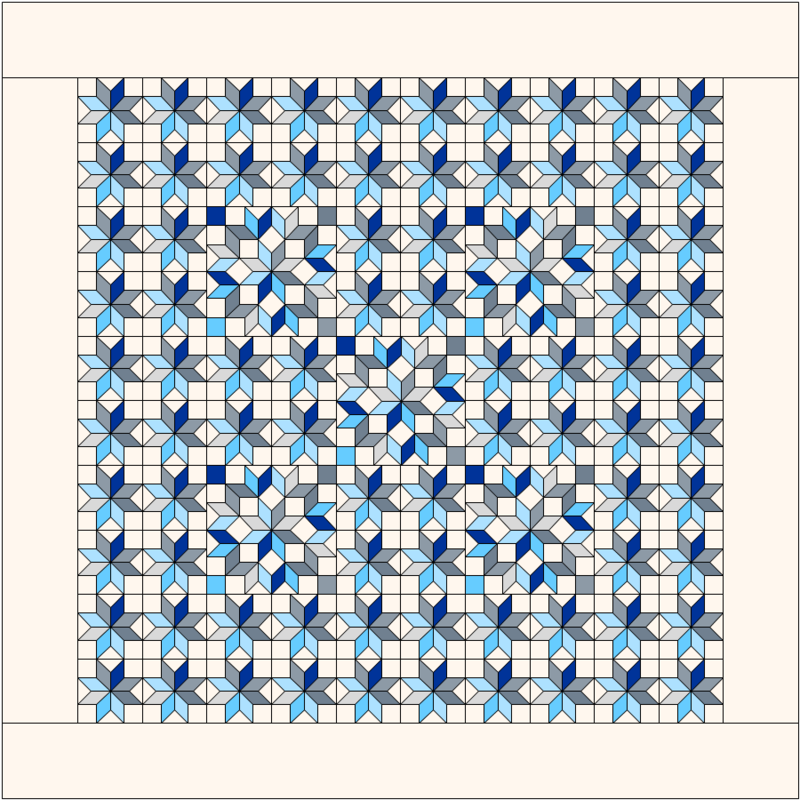 You can still see the blue lines I drew for the inner circles of quilting. Can’t find my spray bottle, so I’ll soak it in cold water after I sew down the binding to the other side. I decided to use the fabrics from the top to make a scrappy-ish binding instead of the backing fabric. 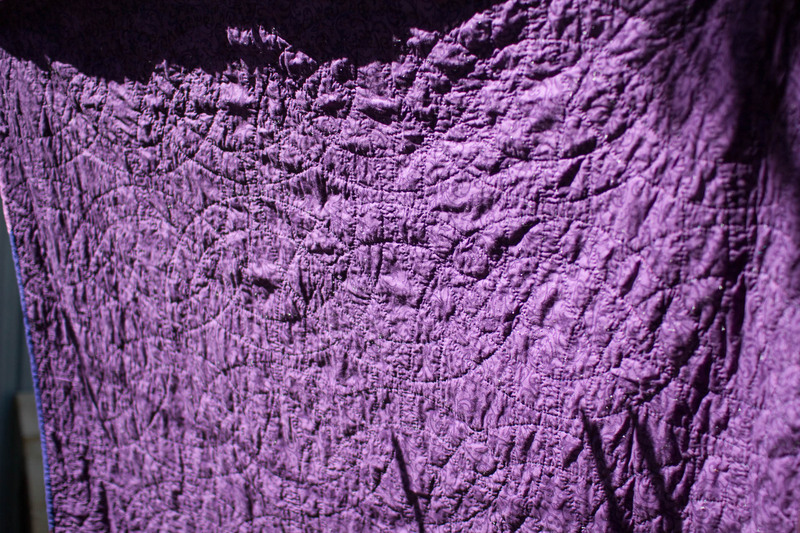 So here are a few photos of the quilting done so far. 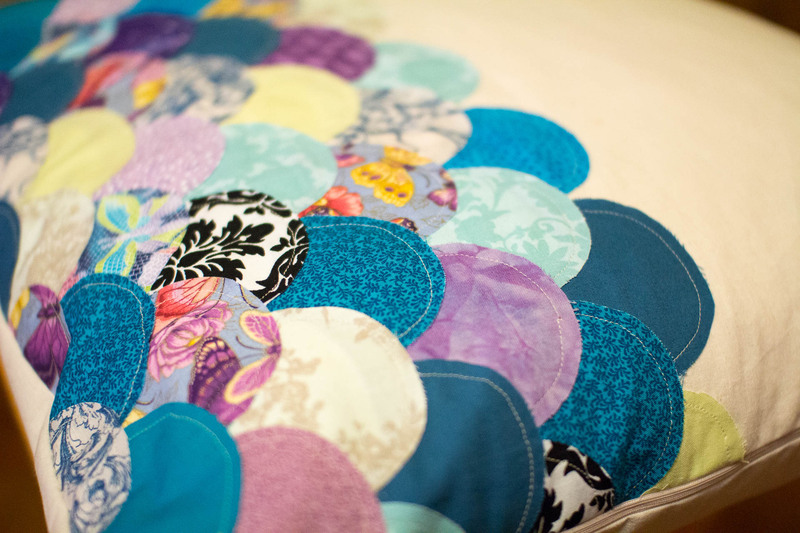 Do you think I should add another inner circle of quilting? 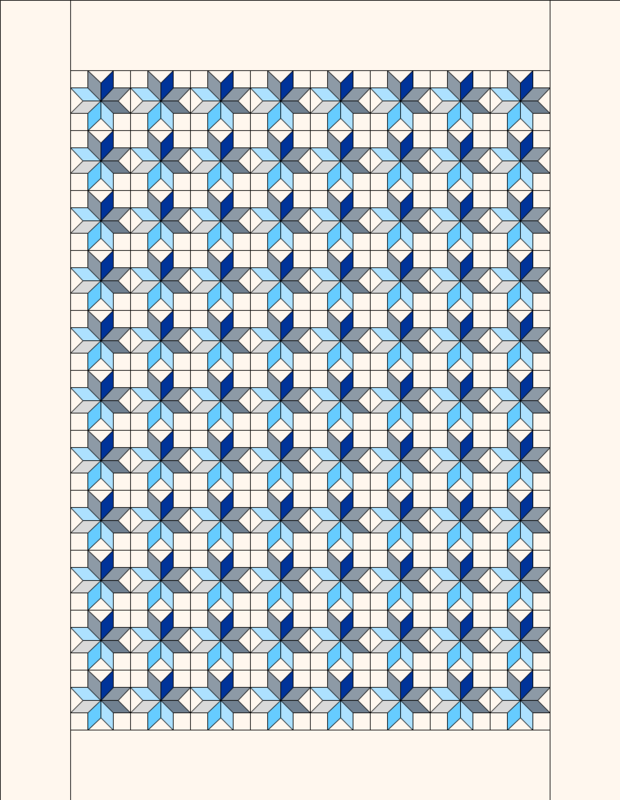 Technically, I think this enough quilting for the batting, but I do feel that it could use more from an aesthetic point of view. That’s right! I’ve managed to start and complete a project! Remember the crochet from the last post? Well, it’s done and has been done for a while. I’ve just been so busy with work, baby and moving house. The main reason I’ve made progress on any of my projects is my commute to work. Which means, of course, that the only projects that get my attention are the portable ones! First, I finished the crocheted scarf. I really enjoyed the double-hook Tunisian crochet process. It was quite a lot of fun… once I figured it out. 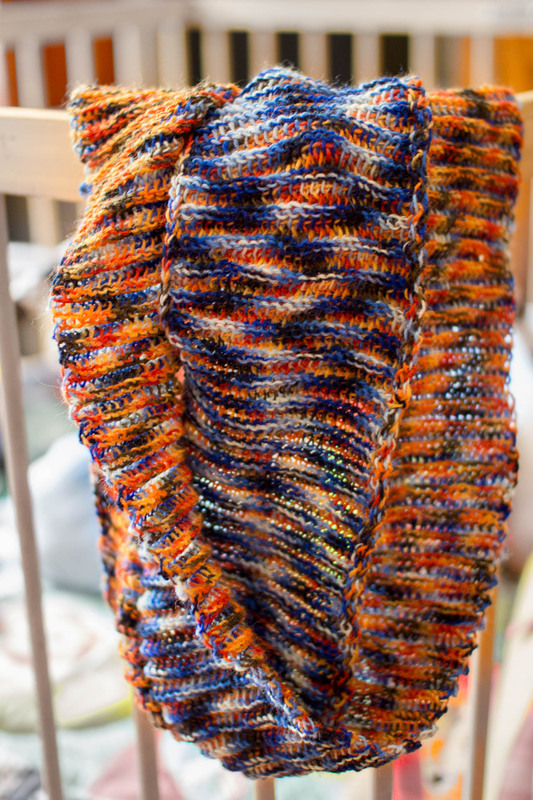 The scarf was one long piece that I’ve sewn into a twisted spiral. It’s effectively a Möbius strip. 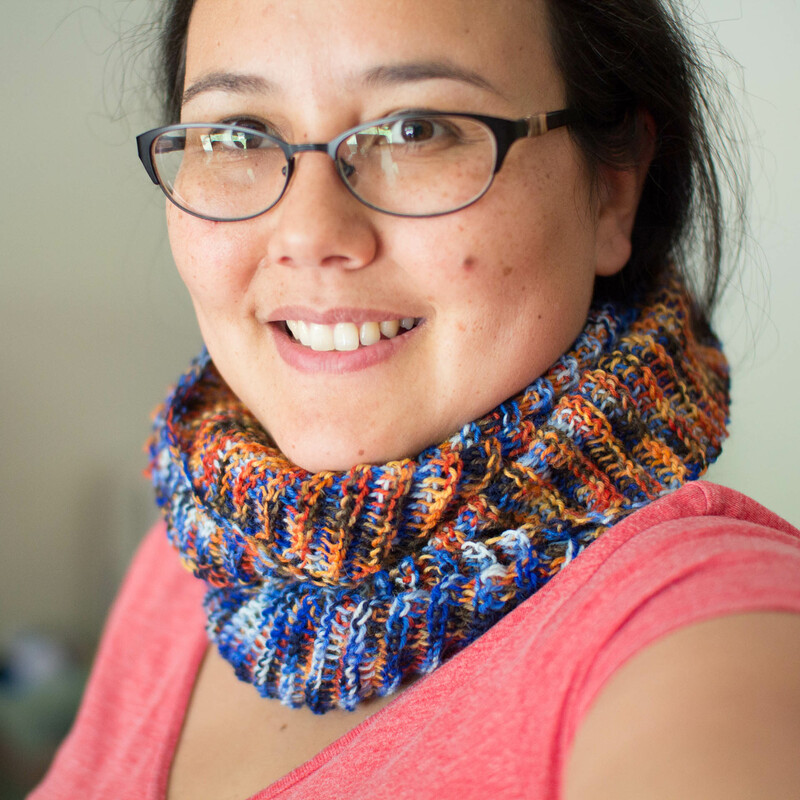 And because I only had one skein, it is more of a cowl than a scarf. But I like it! With the scarf completed, I went through my project closet to see what I had that was in progress and doable on my commute. 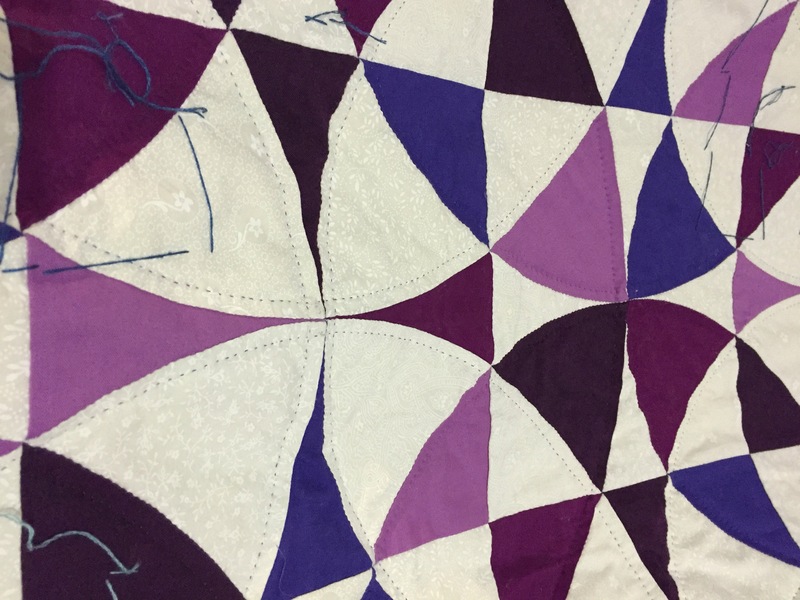 I rediscovered my Alabama Chanin Indigo Star Quilt! The nice thing with this project is that once the top is done, the project is done! I used Inklingo 6″ Le Moyne Stars to print my shapes. 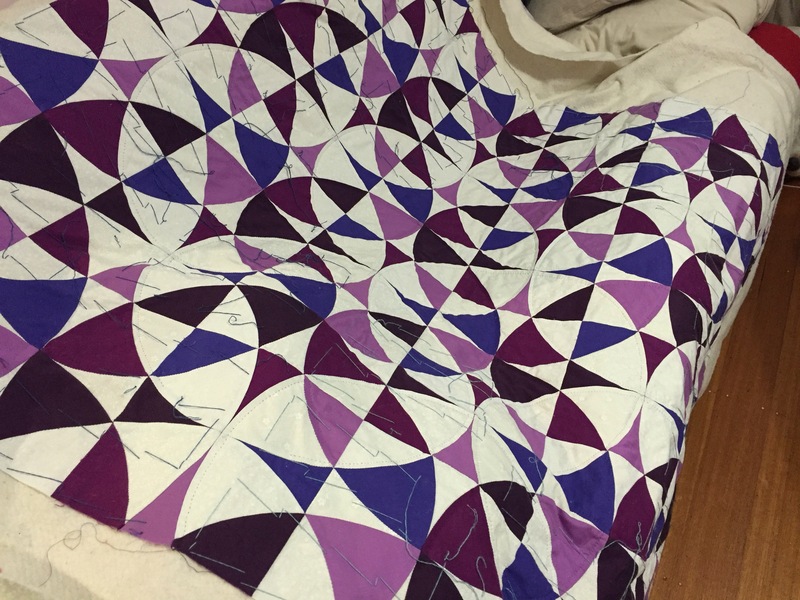 Apparently I started this blog after I started and abandoned the AC Indigo Star quilt. 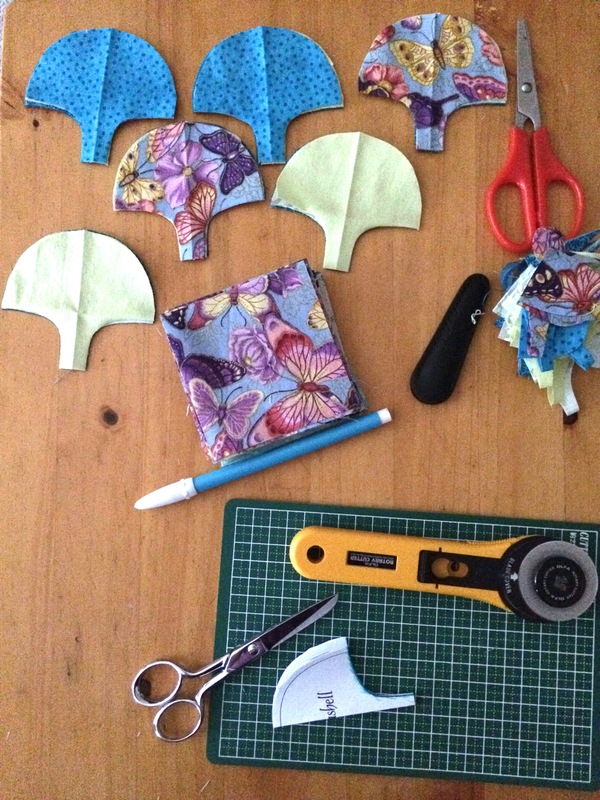 I bought the kit from Alabama Chanin, the fabric and notions, shapes not precut. It came with a printout of the blog entry and I was told that the shapes just needed to be enlarged. Except they didn’t fit with each other and I didn’t know how much to enlarge them by. Maybe it was my experience as a quilter, but I just couldn’t handle the vagueness of the instructions. This was what sent me off in search of a better solution: Inklingo! 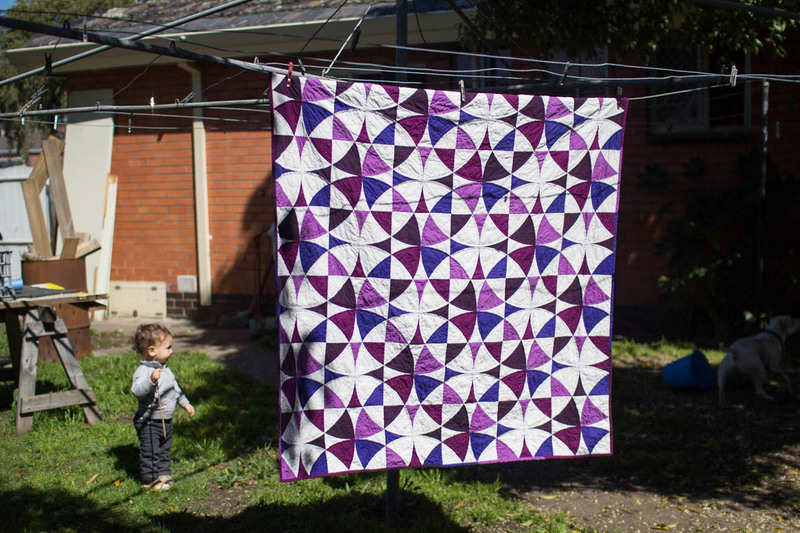 I was told that the finished block size was 7.5″ but at the time, Linda only had the Le Moyne star in 4.5″ or 6″ blocks. I decided that 6″ was close enough and set off printing and cutting diamonds. 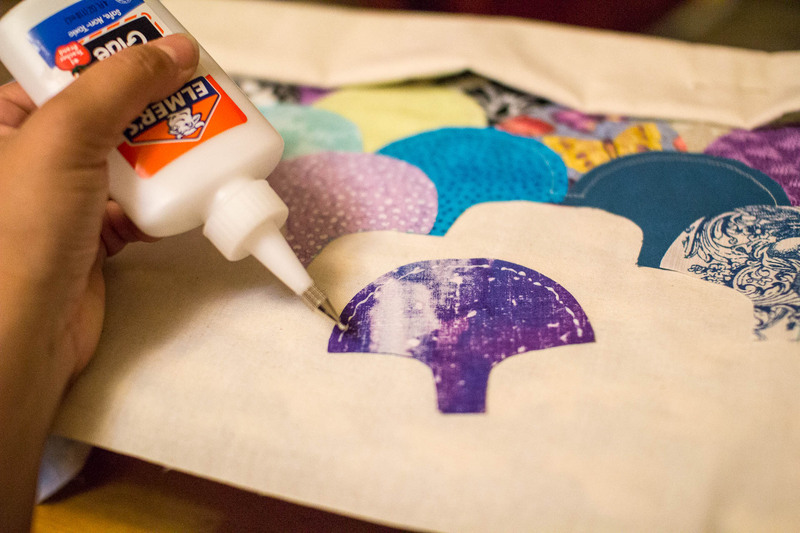 Just so you know, printing on cotton jersey works just as well as printing on quilter’s cotton! 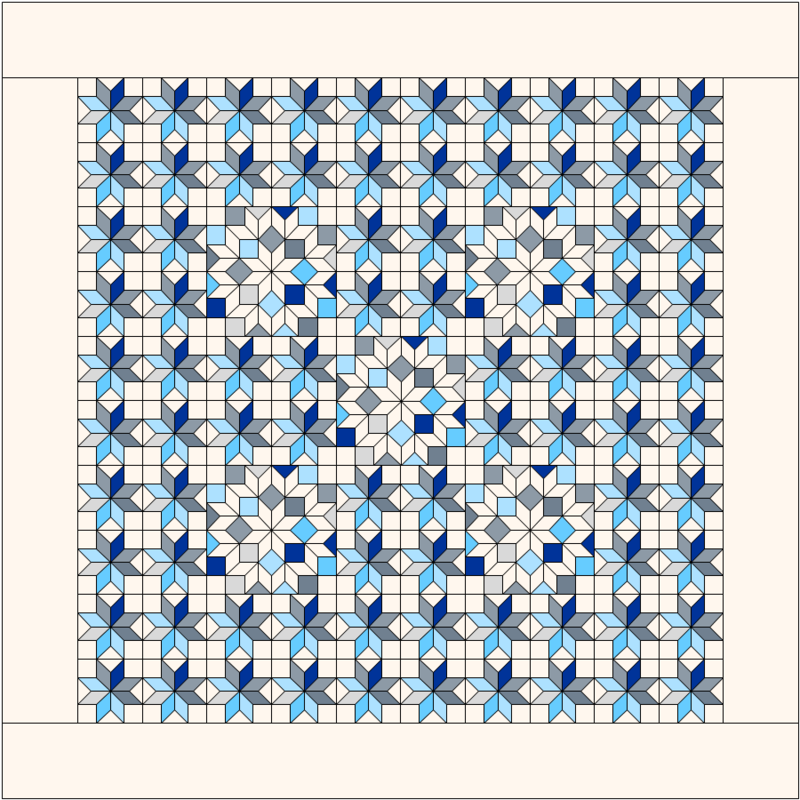 I already have many stars sewn together but I haven’t really printed many of the squares yet. 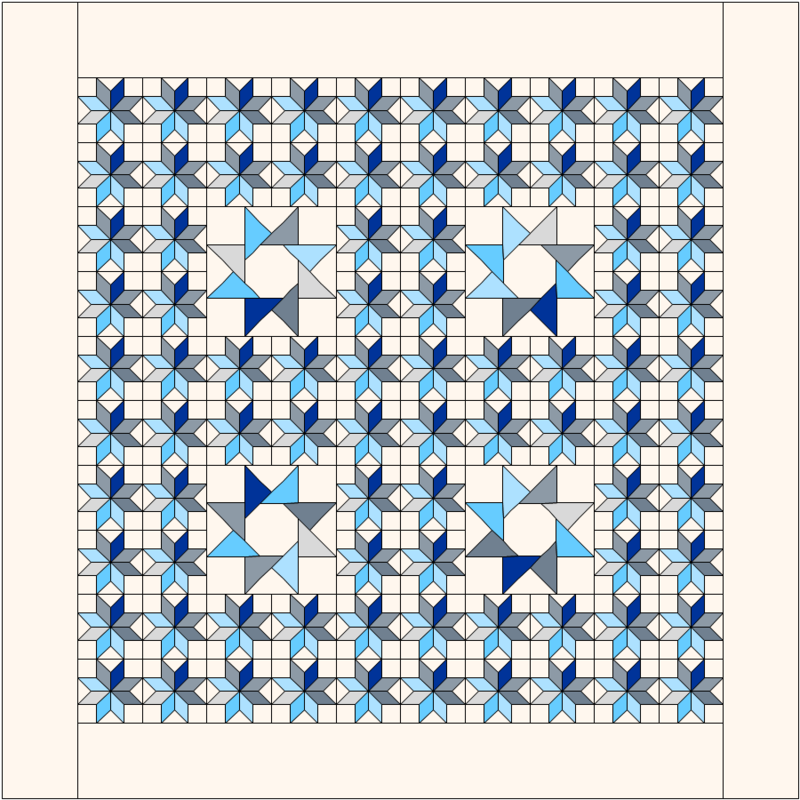 I’m hoping to get those printed soon because it’s really satisfying seeing the completed block. Here is the kit I’m currently taking on my commute. Two stars completed in this bag, a third star almost finished, and a stack of diamonds to go. 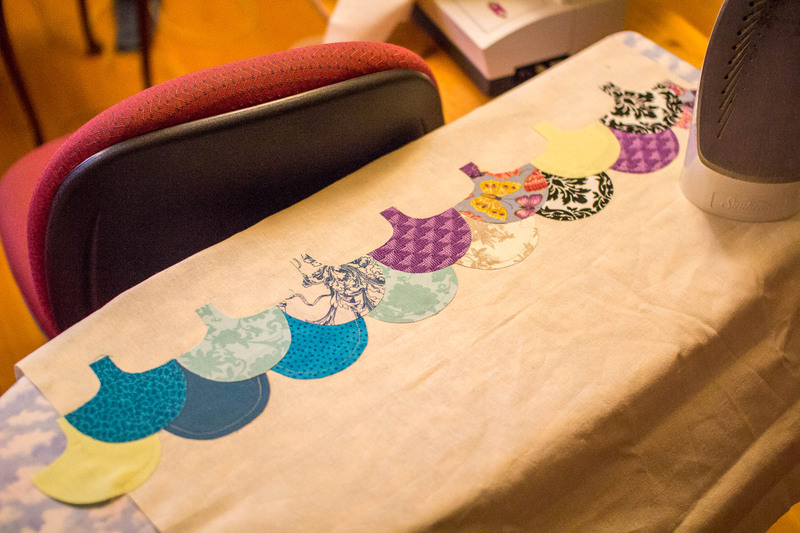 And in Big, Exciting news, the Winding Ways baby quilt top is finally complete! Doesn’t it look glorious in all its precise-matchedness? And the circles are so perfectly round. Makes me happy. It’s also basted and in the midst of quilting. 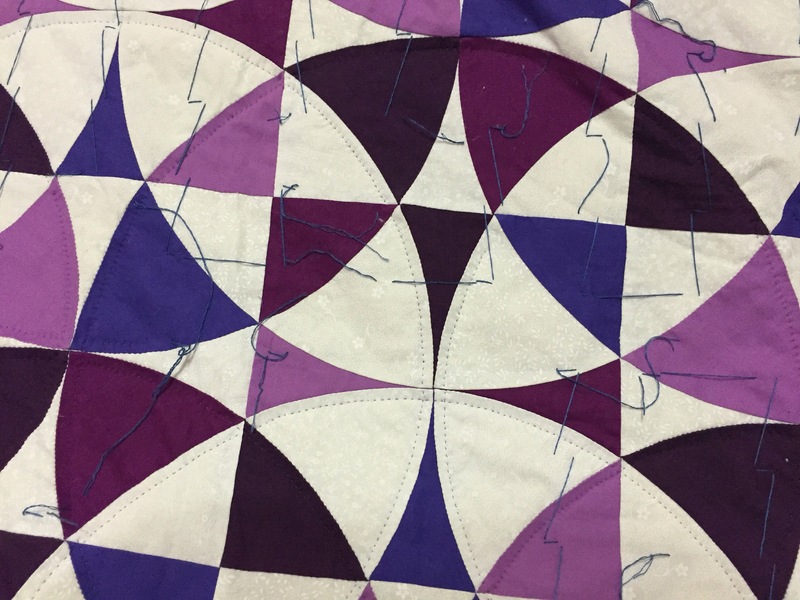 I’m currently quilting a quarter-inch inside the circles and I’m thinking of adding an extra ring an inch or two inside of that. Still deciding, though the single ring doesn’t feel like enough quilting. So that’s the update, finally! Next new projects will likely be of the wood furniture variety. To be continued! And, oh, so many things have happened! But mostly, this little guy has been taking all my project time and then some! But that’s not all! I’ve been trying to tidy up my project closet, and found some treasures. 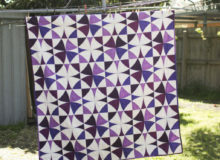 My very first quilt was the quilt I started in my first quilting class twenty-something years ago. A pinwheel and single Irish chain. 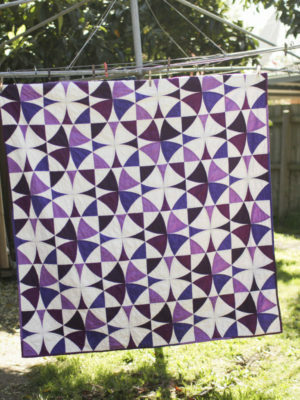 Now, this quilt is in daily use and while my fabric choices would be different today, I’m still fond of my first quilt. I was absolutely determined to not have a UFO. It took a couple years, but I made it! So the treasures I found were the tools and items of process in making it. My design sketches. The teacher of the class had us make up prototype blocks. I’m not really sure why except maybe to give us a sense of the scale and how our fabrics look together. In retrospect, a good idea, ha! And my little plastic templates. The pencil lines give evidence to how often the pencil slipped. Oh, if only Inklingo existed then! And inkjet printers! But it worked and my quilt isn’t too wonky. 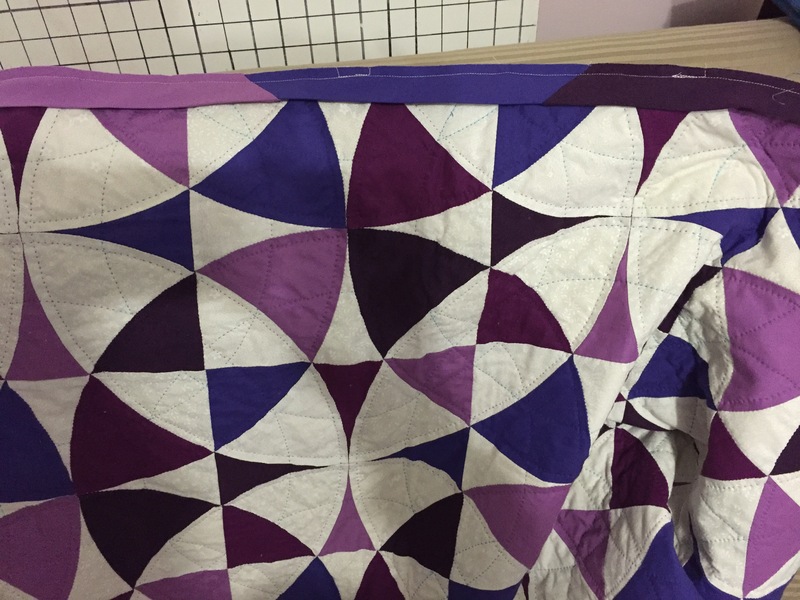 This was my mini test-quilt where I practiced certain techniques before applying them to the “real” quilt. 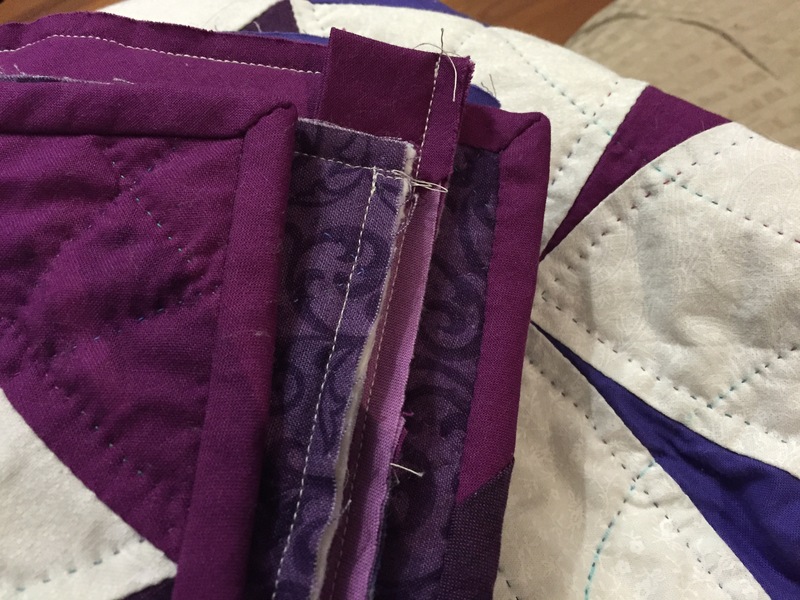 Techniques practiced: Mitred borders, hand quilting, binding. And finally, my Winding Ways quilt. 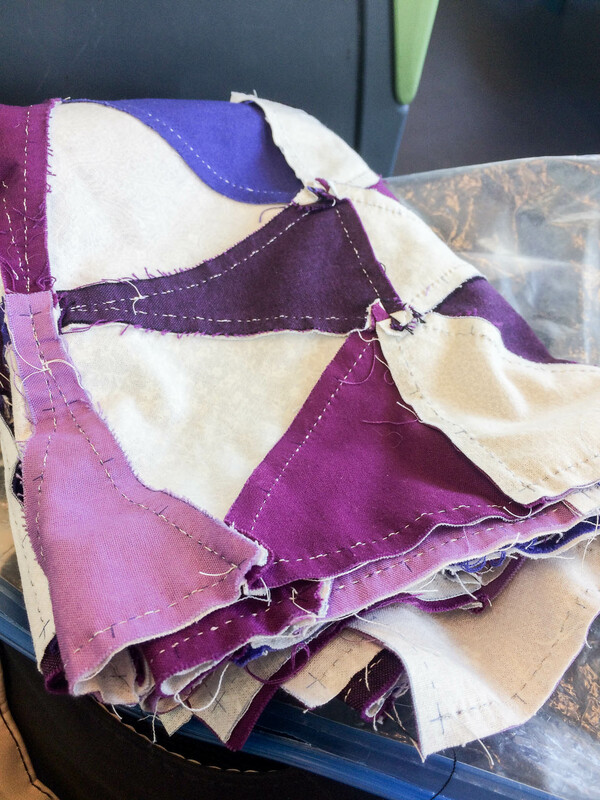 This is four rows sewn together, the last seam is the one that joins four rows to two rows, but I need to press first! I figure it’s easier to press the smaller pieces separately than to try to press the whole top in one go. I might see if I can get to this point today! Maybe even have that last row sewn this week! We can dream! 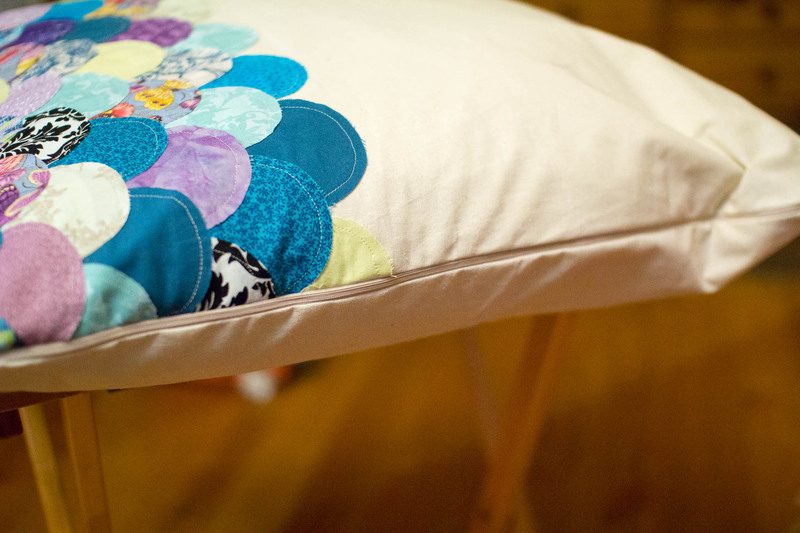 I signed up for the Curves class by Rachel through her Stitched in Color blog and the Clamshell Pillow is one of the many projects in the class. I haven’t had time to do anywhere near all of them, but I was determined to do at least this pillow! 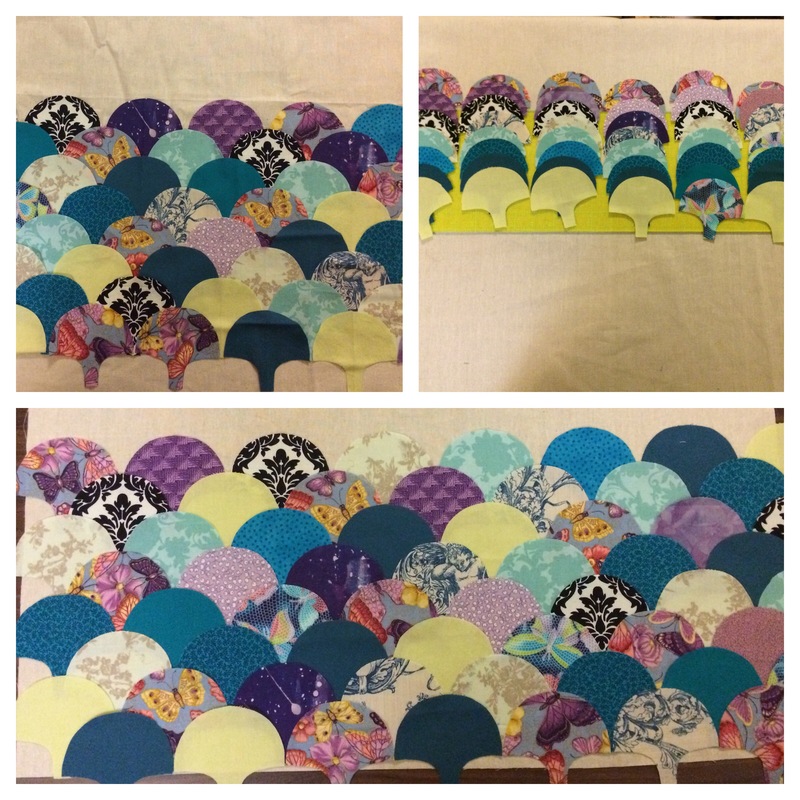 And definitely the Scallop Quilt. 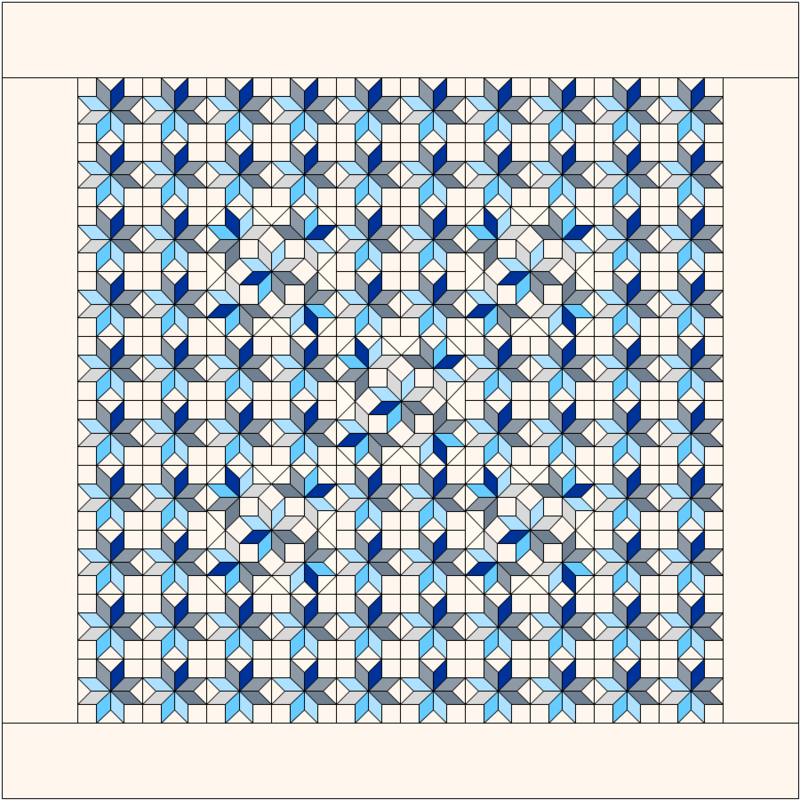 Anyway, I already had a pillow insert but it’s 65 x 65cm, not the size in her pattern, so I used EQ7 to test the pattern on a larger pillow. 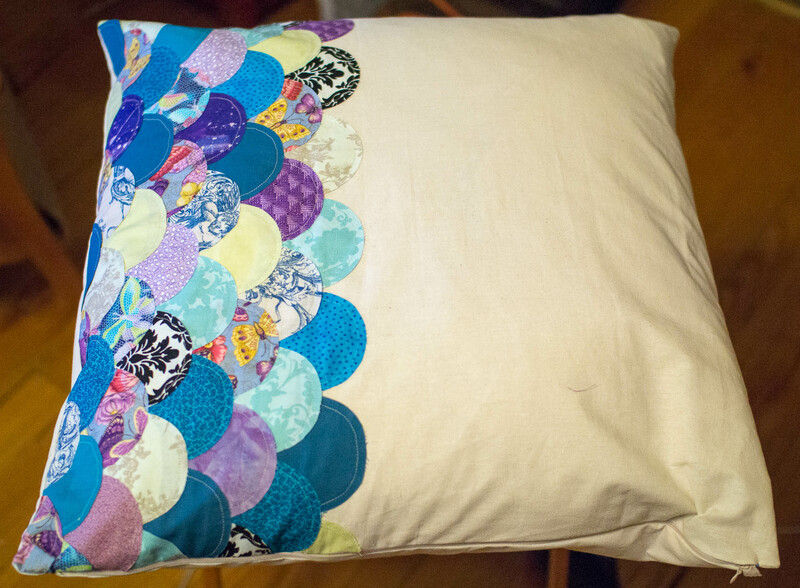 I used the clamshell template as provided and increased the number to fill almost half the area of the pillow. I tried out a few color configurations. And ultimately decided on the bottom one. Looking at them together, the first doesn’t look a lot different from the last! First row sewn, second row glued down. So much easier than pins! Close-up of the gluing. All rows sewn down! Very happy with the result. And the zips arrived in the mail the day before, so no excuses attempting the finish! The finished piece! Not quite invisible, but good enough for first attempt! And another close-up for good measure.